Slopeside Ski/Golf accomodations in Copper Mountain. As roomy as a 3 bedroom with a Fantastic Location-SLOPESIDE!!! Mountain Plaza Building in the Center Village at Copper Mountain. 100 foot walk to American Eagle quad chair, 200 foot walk to American Flyer lift (intermediate), 200 foot walk to the Magic Carpet (beginners). RECENTLY COMPLETELY RENOVATED!!!! Special discounts for rentals and lift tickets available to accomodate up to ten people!!! No Smoking unit. Roomy two bedrooms almost 1200+ square feet (larger than 90% of Center Village units!). Lake views from completely-enclosed deck overlooking West Lake. Underground Parking within building. Wood-burning fireplace (firewood included). Amenities within building: childcare center, private underground parking, three ski lockers, washer/dryer, restaurant, and hot-water baseboard heat. FREE shuttle bus for mountain and Frisco. Bedroom #1: two queen-size beds. Bedroom #2: two full-size beds. Living Area: one queen-size, upgraded sofabed. Comfortable dining area that also serves as a large work area with phone line for internet access. Three full baths, all with hairdryers and heat lamps. Four large closets. Kitchen is fully equipped with all utensils, coffee maker, microwave, dishwasher, and garbage disposal. FREE local phone service. All rates are inclusive. THERE ARE NO ADDITIONAL CHARGES. SAVE BY RENTING DIRECT FROM OWNER! Great location but place could use some attention. We are a family of 5. We chose Mountain Plaza because of the great location. But the "home" is actually an efficiency apartment with 2 adjoining hotel style rooms. Therefore the kitchen was TINY and not good for cooking for a large family. The kitchen dishes, knives, etc, were very cheap and sparse. So, if you rent this place, don't plan to cook. The sofas were the most uncomfortable things we have ever sat upon. The back of the sofas make you sit up ram rod straight - even forcing your head ahead of your body. The thermostats do nothing - you are forced to live in whatever temperature the building sets for you - baseboard heat. The property manager did bring us 1 space heater when we got really cold. 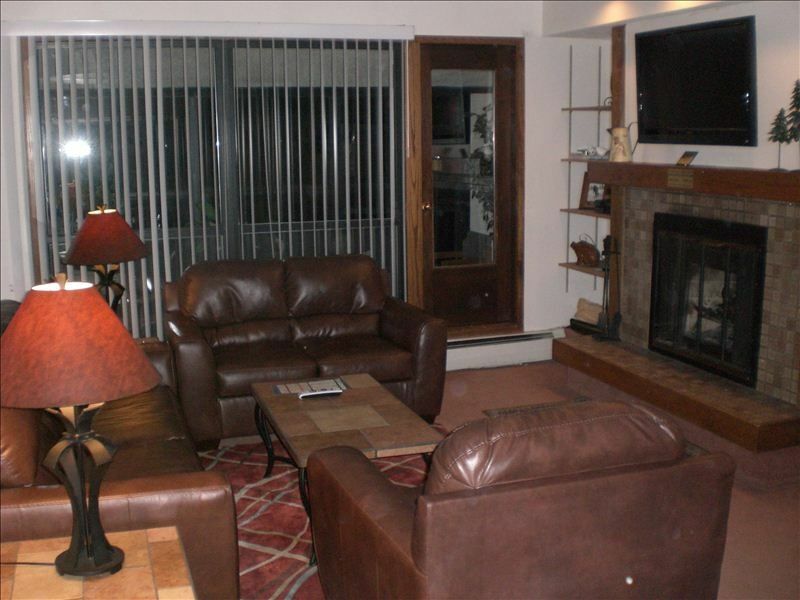 Cosmetically, it is decent - nice new TVs, upgraded bathrooms; we enjoyed the balcony and wood burning fire place. We loved this place! The location is incredible! We had a fantastic view of the lake across our building and even allowed our 12 and 10 old kids to go out by themselves to play on the lake since we could monitor them from our apt. The other side of the building is just across the Copper Rental services so it was extremely easy to pick up and drop off our rentals. The apt. was spacious and very comfortable for our group of 3 couples and 3 kids. We cooked every day breakfast and dinner and had enough utensils. We found plenty of towels and toiletries. A plus was to have a storage place for skis. We also had easy access to the hot tub, a special favorite of the kids. Overall we recommend this place and would try to rent it again next time. We were a group of 9. Beds were fine but sofa sleeper was straight up laying on springs. Kitchen is small and oven fan was not working. Thanks to the good people at Copper Vacation for coming to repair. There were only 7 towels available for our group. Location is terrific. Nice, large condo. Could use a few more items in the kitchen (pots, bowls, plates). Great place, would rent again. Location could not have been better! Loved having the 3 bathrooms. Nicely updated unit. We really enjoyed our stay here for some great spring skiing. Management was very responsive to needs. Some noticeable wear and tear. Closet doors don't work well. Location is prime. Elevators very slow at times. Owner contacted me nice personal touch. Would like to have Hot tub open to 11..